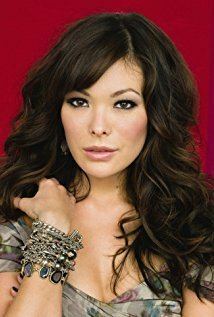 Born December 6, 1976 (age 39) (1976-12-06) Arcadia, California, U.S.
Lindsay Jaylyn Price Stone (born December 6, 1976) is an American television actress and singer. She is best known for her roles as Janet Sosna on Beverly Hills, 90210 and as Victory Ford on Lipstick Jungle. She is also known for her work on soap operas such as All My Children and The Bold and the Beautiful. Price was born in Arcadia, California, to William Price, who is of German and Irish descent, and Haeja Diane Price, who was born in Korea. Her parents were raised together as brother and sister, as the Price family adopted an orphaned daughter from Korea after the Korean War. Price's mother, born Kim Hae Ja, and her biological brother were abandoned by their mother who remarried after her father was killed in the War. Price attended the Art Center College of Design in Pasadena, California. Price's early appearances include a 1982 Toys "R" Us television commercial with fellow child star Jaleel White, a 1989 episode of The Wonder Years titled "Walk Out," and an episode of the game show I'm Telling! with her older brother, Bryan. She appeared as An Li Chen on the daytime soap All My Children and as Michael Lai on The Bold and the Beautiful. She joined the cast of Beverly Hills, 90210 in January 1998 as Janet Sosna, a graphic designer at the Beverly Beat newspaper. She remained on the show through its finale in May 2000, appearing in a total of 73 episodes. She then reprised the role as Michael Lai on The Bold and the Beautiful from June to August 2000, April to August 2005, and November 2009. Price had a recurring role on Becker, where she played Amanda, Jake Malinak (Alex Désert)'s girlfriend, a role that spanned three seasons. In 2006, she co-starred on The WB television show Pepper Dennis, opposite Rebecca Romijn, in the role of Kimmy Kim. She appeared in the short-lived American remake of the British series, Coupling, in addition to singing the show's theme song, a cover of "Perhaps, Perhaps, Perhaps". She guest starred in NCIS for two episodes as a neurotic fling of main character, Anthony DiNozzo. From 2008–09, she starred in the NBC drama Lipstick Jungle as Victory Ford, an up-and-coming fashion designer in New York City. She guest-starred in an episode of How I Met Your Mother and played Joanna Frankel in the short-lived ABC television series Eastwick, where she once again starred opposite Rebecca Romijn. Price has also had a career in music. Price wrote and performed on a five-song EP entitled Someone Like Me, which was released in 2007. Price married Shawn Piller, co-developer of the television show The Dead Zone, in July 2004 at a ranch in Malibu. They divorced in 2007. She subsequently began dating Australian celebrity chef Curtis Stone in late 2009. Price and Stone became engaged in July 2012, and married on June 8, 2013 in Spain. They have two sons: Hudson (born November 2011) and Emerson Spencer (born September 2014).